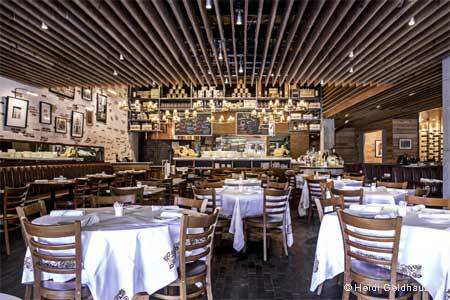 Pizza and classic Italian dishes at The Shops Buckhead Atlanta. About the décor: Taverna Buckhead in The Shops Buckhead Atlanta has a modern interior, warmly lit and attractive, but in good weather, the patio is better for avoiding the noise level. Food & Drinks: The menu includes pizza as well as some classic Italian dishes, creating a variety of dining options. Drop in for a happy hour snack, Mon.-Fri. from 3 p.m. to 6 p.m., when such items as pizzette and other nibbles go for $5. (There are other specials weekly as well.) If dining with a group, consider the beautifully composed meat and cheese arrangement designated an antipasto. Although we were assured the risotto was cooked to order, its too-rapid appearance after being requested made it evident this was not the case, resulting in rice that was not al dente. The best dish was the fettuccine ai frutti di mare, which assembled a bounty of fresh seafood atop a mound of homemade pasta. Share a pasta for a first course before a main dish of veal, chicken or fish. For dessert, opt for a chocolate hazelnut treat that’s beyond rich and plenty for two; coffee with it is a must. The wine list is loaded with good Italian choices, including many by the glass.